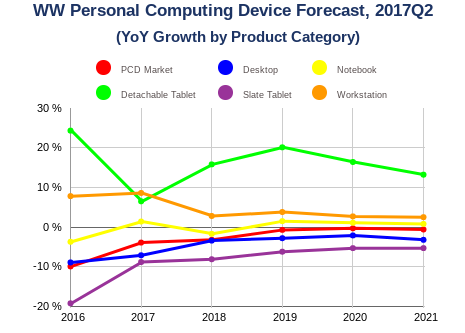 According to the latest worldwide market study by International Data Corporation (IDC), global shipments of personal computing devices (PCDs), comprised of traditional PCs (desktops, notebooks, and workstations) and media tablets (slates and detachables), will continue a decline through 2021. The study results show PCD shipments declining from 435.1 million units in 2016 to 398.3 million in 2021, which represents a five-year compound annual growth rate (CAGR) of -1.7 percent. While growth for the overall PCD market is not expected at any point within the forecast period, there are a few interesting trends that continue to develop. Apart from 2018, notebook PCs show small but steady year-over-year growth throughout the forecast period. Detachable tablets and convertible notebooks, which represent more versatile designs, will be the fastest growing segments in PCD with a 5-year CAGR of over 14 percent. Ultraslim notebooks are also expected to continue to grow, with a CAGR of 11.8 percent through 2021. The other upside forecast is the commercial segment, which stabilizes in 2017 and shows some growth in 2019 and beyond. "Looking at the PCD market collectively can be challenging because of all the different product category trends that are unfolding," said Ryan Reith, vice president at IDC. "When looking at tablets we continue to expect that category to decline as the appeal of slate devices diminishes and life cycles for these devices look more like those of PCs 4-5 years ago." Detachable tablets will continue to grow, but IDC has reduced their short-term forecast on the assumption that OEMs are making a slower transition from notebook PCs to detachables than previously expected. The good news for this space is that both consumers and commercial buyers are adopting Windows 10, and Windows detachables already represent more than 50 percent of shipments in the category. This should continue throughout the forecast period. IDC believes that the traditional PC market continues a steady transition to newer slim and convertible designs. Nevertheless, commercial and particularly consumer users continue to stretch the life of older PCs – constraining their spending and spreading usage across a portfolio of devices. Shipments could pick up if accelerators like economic conditions, adoption of gaming, virtual reality, and Windows 10 speed up -- but even in the best case, overall growth would likely remain limited.